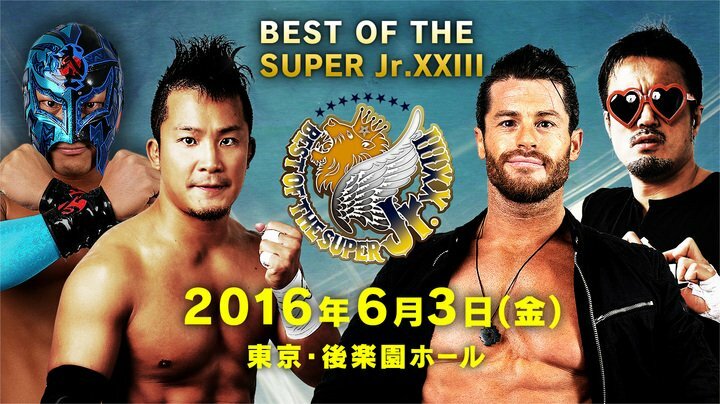 This round is the Best of the Super Juniors tournament will bring amount some more clarity as to who has a shot at winning the whole thing. Names like Jushin Liger and KUSIHDA need a win in order to stay alive. Let the games begin! Kyle O’Reilly (2) defeated David Finlay: There was a lot of mat wrestling here, which the crowd really got into as the match progressed. Lots of submissions were traded back and forth, near the end, as Finlay kicked out of a brainbuster and right to a gogoplata to end his night. Rocky Romero (2) defeated Gedo: This was one of the funniest matches I’ve seen in a while. Gedo is upset that Rocky brought Trent Baretta (RPG Vice) out to the ring with him. Romero insists he just wants to watch and nothing more. Right as there about to come to blows, they all hug it out in the ring. Gedo is so moved by this that he offers Romero a “present” by laying down for him. Yeah, it was easy to see where this was going, and it was still funny to watch it unfold. Romero went for the cover and Gedo rolled him up for a two count. Baretta interfered and kept kicking Gedo while apologizing after every boot. The end came when Romero landed a double knee strike for the pin and of course, everyone made up afterwards. BUSHI (2) defeated Ryusuke Taguchi: Sometimes Taguchi’s shenanigans are enjoyable. This time they was rather annoying. BUSHI won with the codebreaker and sprayed green mist in Taguchi’s face for good measure. Will Ospreay (2) defeated Jushin Liger: The mere thought of this match gave me chills. While it was nothing to write home about, it was pretty good. Liger and Ospreay sell like madmen here. Ospreay delivered the “cheerio, mother*&%$#” forearm smash without calling Liger that bad word. Ospreay won with the springboard RKO and afterwards helped Liger to his feet and shook his hand. Tiger Mask (2) defeated Trent Baretta: It took a while for the crowd to get into this match. They brawled outside for a bit. Baretta kicked out of a Tiger Bomb, but Tiger was able to lock in a double arm submission for the win. Tiger Mask played the role of spoiler as he was already eliminated from the tournament, but this win knocked Baretta, too. After the match, Baretta went to shake hands, Tiger obliged, and Baretta kicked him low for his troubles. Bobby Fish (2) defeated Chase Owens: I’m a sucker for mat wrestling and Fish does it with the best of them. Owens held his own here. Owens worked Fish’s leg quite a bit. Fish returned the favor at the end as he escaped a package driver and applied a leg lock for the tap. Volador Jr. (2) defeated Ricochet: This was a high flying affair. Volador’s win keep things interesting as far as the point are concerned. This finish were was crazy as Ricochet went for an Alabama Slam but Volador countered with a hurricanrana that planted him right in his head. Final Thoughts: Tomorrow night is the semi finals where the point system becomes a little tricky and exciting. It’s not just about the points but who you’ve beaten and lost to. For example, in Block B, Ricochet has 10 points, however, if he loses to Chase Owens tomorrow, he has to hope neither Volador Jr. or Will Ospreay score points. This will be fun indeed.